Stallion Register Online list of horses entering stud in 2009. From Andronikos (GB) to Zanjero, meet all 100+ new sires in the Blood-Horse index. 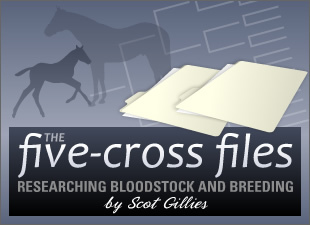 New Sires of 2009 free PDF download. Direct from the pages of The Blood-Horse magazine, here are biographies, charts, and commentary on the new class of incoming sires. Tiago (SRO): I see terrific opportunities in 15 years to inbreed to half-brothers Tiago and Giacomo (SRO) -- both Classic-quality horses that descend from solid, hard-knocking, outcross sire lines. Nobiz Like Shobiz (SRO): I never thought Albert the Great (SRO) got his due recognition, and I'm excited to see an early-crop son going on to stud after grade I wins at 2 and 3, and graded victories on both dirt and turf. Keyed Entry (SRO): Florida's a great place for the bloodlines of Honour and Glory (SRO), and Keyed Entry adds a nice inbreeding to the sire-producing family of Grand Splendor. (Pedigree geeks: try crossing Keyed Entry with mares that have Ogygian (pedigree) in their background, and the linebreeding becomes more intense, as Grand Splendor's daughter Gonfalon is the dam of Ogygian as well as the granddam of Honour and Glory, while Grand Splendor's daughter Killaloe is the dam of Fappiano, sire of Keyed Entry's broodmare sire.). Take a look at the links I referenced... who do you like?